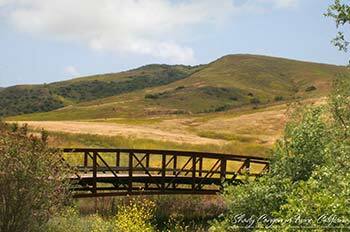 The Irvine Ranch Natural Landmarks stretch in a giant green crescent from Weir Canyon near the 91 Freeway at the north end of the Irvine Ranch… connect with the Cleveland National Forest along the ranch’s northeastern border… continue south where they include the massive regional open space network in the northern and southern hillsides of Irvine… and extend all the way to Laguna Coast Wilderness Park and Crystal Cove State Park near Laguna Beach. Prized for its beauty, unusual geology and extraordinary diversity of flora and fauna, the Landmarks feature many special places unlike anywhere else. 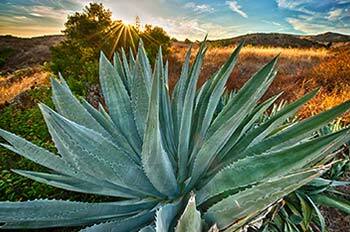 Among them: 5,500-acre Limestone Canyon, home to a striking geological formation called the “Sinks” that is frequently compared to a miniature Grand Canyon; the San Joaquin Wildlife Sanctuary, one of Southern California’s largest coastal freshwater marshes; Irvine’s beautiful and tranquil Bommer and Shady Canyons; the distinctive Quail Hill preserve, the life-covered tide pools of Crystal Cove beach, and more than 7,000 acres of coastal hills and bluewater views. The expansive northern region of the historic Irvine Ranch — adjacent to the Cleveland National Forest and the communities of Orange, Anaheim, Tustin and Irvine, contains more than 20,000 acres of permanently preserved open space and rare natural habitats. These lands form a giant swath of open space stretching east from Gypsum Canyon to the Cleveland National Forest, and contain remote canyons, free-flowing watersheds, and important wildlife corridors that allow animals to move around the landscape. The Mountains includes Weir, Blind, Fremont, Gypsum, Limestone, and portions of Baker, Silverado and Modjeska canyons. Loma Ridge, in north Irvine, preserves natural hillside views from the entire valley below. Besides its sheer expanse, the area is rich in biological diversity and supports an unusually diverse number of rare and endangered wildlife, plants and geological formations. 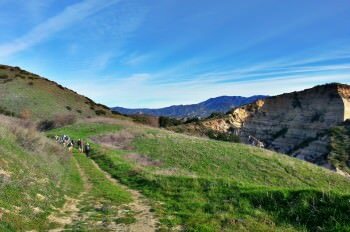 Adjacent to the communities of Irvine, Laguna Beach, Laguna Woods and Newport Beach lie nearly 20,000 sprawling acres of natural wildland in the largest coastal open space remaining between Los Angeles and San Diego. Known as the South Coast Wilderness, these remarkable lands contain some of the largest remaining areas of a rare natural community known as coastal sage scrub along with oak woodlands, native grasslands and craggy rock outcrops. From the ridgetops, visitors can experience uninterrupted views of the coast, Catalina Island and wide expanses of green. A network of hiking and riding trails traverses the area, offering a wide variety of outdoor adventures from beginner to advanced, from families to solitary nature-lovers.